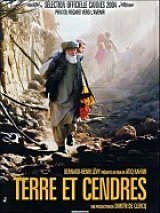 Earth and Ashes or Khakestar-o-khak is an Afghan movie directed by 'Atiq Rahimi' an Afghan/French film maker in 2004. The movie was shot in Kabul Afghanistan in different locations including Panjshir valley. Khakestar-o-khak was the first novel written by Atiq Rahimi when it was warmly received by French critics in 2004 to produce a film. Dastagier sits besides the side of a road and his little grandson Yassin by his side. The desolate Afghan landscape spreads out around him: a partially destroyed bridge, a dry riverbed below, arid mountains in the distance, and a long, dusty road reaching its vanishing point at the horizon. The road leads to a distant mine – a destination dreaded and yet sought out by Dastagier. He reluctantly undertakes this journey to see his son, Yassin’s father, who works at the mine. He must tell him that their village has been bombed and their family killed. He is trapped in his thoughts of the terrible night when his whole family died and little Yassin went deaf and he is afraid that the horrifying news will evoke righteous anger in his son and a desire for revenge. It’s a difficult task for the old man who is torn between his own grief, unbearable solitude and the codes of honor so deeply engrained in the Afghan soul. He somewhat subconsciously postpones their meeting. While struggling with so many conflicting emotions, Dastagier comes across various strangers on his way, a grumpy guard in his sentry house, a philosophical merchant, a mysterious veiled woman who endlessly waits, and other victims of this vile war that continues elsewhere, off screen. Based on his own novel, the the director located the movie on the road connecting Kabul with northern Afghanistan, which passes through an incredibly photogenic landscape. 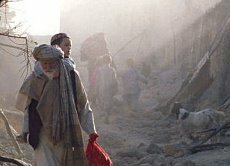 “Earth and Ashes movie” is a fable about devastating loss, redemption and the perseverance of the human spirit when confronted with the atrocities of war. There are a few other prizes and nominations for this nice Afghan movie. Watch the movie trailer by typing your keyword in the search box below.